A trip report for today can only begin with an apology to the reader, who will probably be wondering at this point why on earth anyone would attempt to get to eight different parks in a single day. Clearly they would have to be a coaster counter; the number of Wacky Worms (and equivalents) we ticked off today stands as testament to that. They would also have to put up with the worst of white trash Americanism, the sort only found in seaside holiday resorts. Crucially, though, they would have to be willing to face a major challenge. It was the last of these three facts that was top of my mind as we raced up the eastern coast of the United States. The reader might also be amused to know that the first half of this diary is being written on board a car ferry, which is by far the most efficient way to get from Delaware to the southern tip of New Jersey. The importance of booking this ahead of time, however, made for just one more complication in an altogether crazy day. Needless to say, we booked two separate crossings an hour apart just in case. As luck would have it, however, we made the first crossing with the better part of an hour to spare. One final note before I get on with the day; there are far too many lawyers in this country. As I write this I am ensconced in a lounge towards the front of the car ferry, but unfortunately this location is in ear shot of the nearest door. Every time somebody walks within a metre or two of it a recorded message plays: high door sill, pleeeeeeease, step up. This noise is slowly burrowing into the depths of my brain. If it wasn't there, though, someone would probably stumble, hurt themselves, and sue the ferry company for a few million. And worse yet, they'd probably win. One of the rudimentary things taught in any Computer Science class is the basics of web page design. Those who came up with the web site for Baja Amusements clearly skipped this particular lecture, as their output serves as a textbook example of what not to do. The fun starts with a thirty second animation that cannot be skipped, during which a collection of sound effects are loaded. These, most which consist of squealing tires, then proceed to play as you mouse over assorted tiny images on what passes for a home page. Patient people can eventually determine which attractions are available at the park, but it is far from obvious how to navigate. For the coaster enthusiast, ten minutes will be more than enough to photograph the park as a whole and get a quick ride on the Wacky Worm (#779). Classic game enthusiasts might want to spend a little longer in the arcade, which has a fair few older titles in it such as Galaga, Centipede, and Operation Wolf. These are supplemented by an Ultracade cabinet, which has many more of the classics available, albeit being run under emulation. 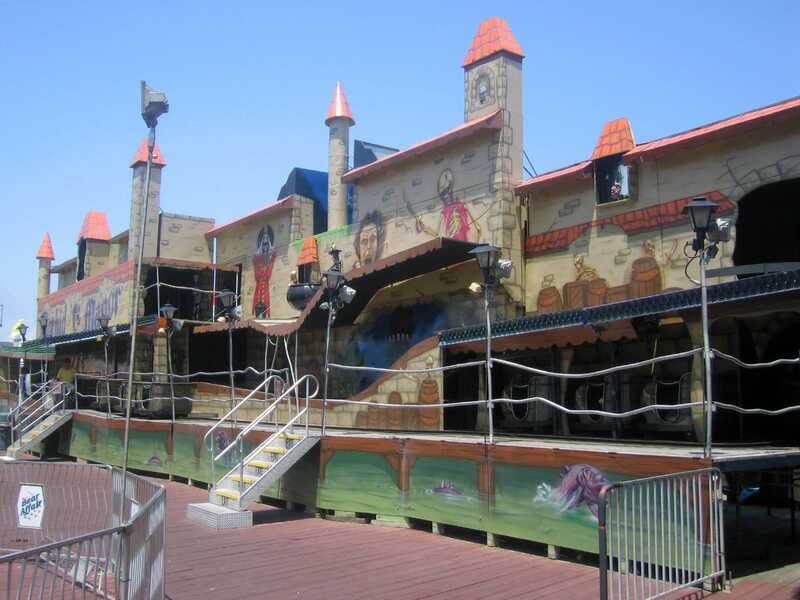 Jolly Roger at the Pier was formerly known as the Ocean City Pier Rides. The change appears to have taken place between when the trip itinerary was written and when we arrived, as the old web site is gone now. With this rebranding came a change in opening hours; from noon, which we had been expecting, to an hour later. To any normal visitor this wouldn't create any major upset, but given our schedule this had the potential to cause us serious difficulties. The time windows for this part of the trip were after all pretty narrow, a necessity brought on by our ferry booking for mid afternoon. Fortunately, however, we were able to walk around the park area before it opened, allowing us to use the time to take decent photographs. 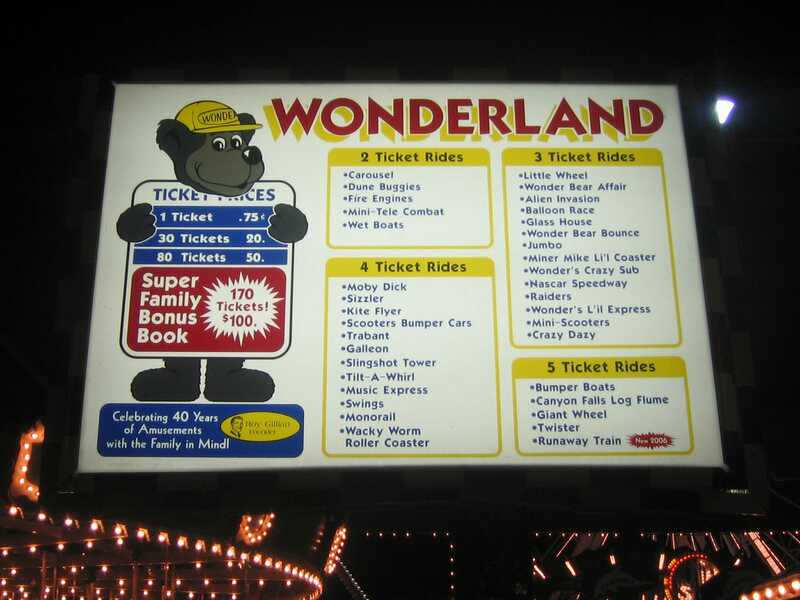 When the ticket booths opened, we made a beeline to the coaster. A very friendly staff member said it'd be about five minutes before the ride was ready, as the operator hadn't arrived yet. To kill the time, therefore, we went over to the Morbid Manor dark ride. From the outside this actually looked moderately decent. However, appearances can be deceptive. The inside was among the worst dark rides either of us had ever seen. It was so bad, in fact, that it is almost worth new visitors going through it just to see how embarrassing it is. Much as I hate to say something like this, the park should be ashamed that they charge guests money to ride. Heck, it would represent poor value for money even if it was altogether free of charge! The Looping Star (#780) coaster, however, was a pleasant surprise. Pinfari rides do not always make for comfortable experiences, but this one was very much the exception to the rule, with only one mild ouch as the train pulled out of the loop. It would be nice if all the remaining ZL42 models could ride as well as this particular one does. 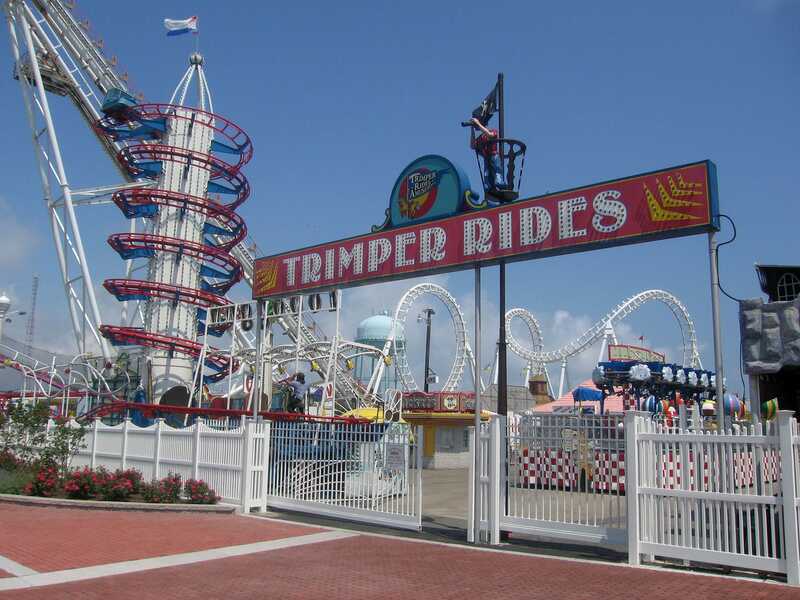 Trimper's Rides is the largest collection of rides in the Ocean City area. It is a misnomer to refer to it as a park; rather, it could be considered instead to be a medium sized permanent fairground. Like many fairgrounds, it makes maximum use of space, with some narrow walkways. It has that rather wonderful feeling of disorganised chaos, with no planning evident in the layout; rather, it seems that new rides were shoe-horned into wherever they could fit, with a coherent design very much an afterthought (if it was there at all). Sometimes chaos is what the doctor ordered, and despite the fact that the coasters were dire it was still a visit I greatly enjoyed. This fairground is confused even more by the fact that it is broken into three parts; the main area, pictured across; a small back area where the kiddie coaster can be found; and a few loose rides located on the boardwalk and surrounding streets. The boardwalk attraction is a rather unique Haunted House, which has to be seen to be believed. It violates just about every usual rule for such attractions, and does so in glorious style, making it exciting and entertaining for its sheer randomness. There were some rather convincing effects which, in the interests of not spoiling the attraction for others, I don't intend to chronicle. Suffice it to say that this is one dark ride that visitors to the area should not miss, and unlike the one at the pier earlier this commentary is actually serious! The three coasters, however, are all eminently missable. Probably the most enjoyable was the Wacky Worm (#781), a brand new model that was so new you could still see the shine on the paint. The other two, Tidal Wave (#782) and Toboggan (#783), marked typical specimens of their respective genres, with some significant head bashing. Oh well. The last stop on the Maryland side of the trip had two coasters, a bog-standard Wild Mouse (#784) and a bog-standard Wacky Worm (#785). There isn't much new that can be said for either, and due to time restrictions brought on by the planned ferry crossing we elected not to explore the rest of the park at all beyond what could be seen from the top of the mouse. It didn't look like we were missing much, however. 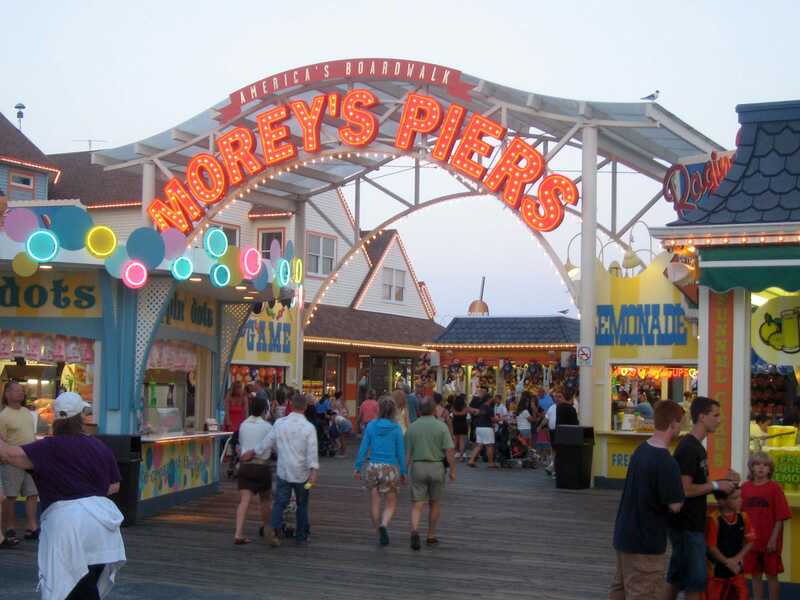 Morey's Piers is a collective name for three reasonably sized piers off the New Jersey coast, each hope to a decent selection of rides. They are large enough, in fact, that each could stand on its own as a small park. Having all three within a few minutes walk of each other, and more to the point covered by the same wristband, is just a bonus. Though we arrived here at six in the evening it was evident that things were just beginning to start up for the night; the crowds were relatively light, but grew substantially over the two hours we spent there. The best coaster in the place was the first we got to. Great White (#786) was running two trains, but the staff were only loading one due to the size of the crowd. This is sensible forward planning; the park clearly gets busy in the evenings, so rather than shut things down to add another train they simply keep it in place until it is needed. Other parks could learn from this policy. The ride has a surprising beginning for those not expecting it, with a fifty foot drop straight out of the station into an tunnel under the pier, which leads to the lift hill on the other side. From then on the ride shows all the qualities that CCI rides are known for. It was this coaster that marked the only point in the whole day in which our frenetic scheduling proved problematic; it would have been very nice to go for a second circuit, but there simply wasn't the time to do that without losing the last park of the day. We did, however, manage to squeeze in a quick go on the sky ride, which allowed for some excellent aerial photographs. The longest queue of the day was found on the least interesting coaster, being a clone of others available in the area. Though we both enjoyed Flitzer (#787) it was hard to see how this could develop a twenty five minute wait. The only possibility I could think of was that, as the first coaster on the pier, it was the one parents would remember and share with their children. Who knows? My last encounter with a Zamperla wild mouse had left me dreading what Doo Wopper (#788) would be like, but it turned out that my fears were unfounded. This installation was butter smooth, and hardly braked at all. This marked a very sharp contrast to Great Nor'Easter (#789), which was among the worst of its genre. For some reason the park has seen fit to install DVD recording systems on the train; this strikes me as a wonderful opportunity for a lawsuit; patrons having official footage of their heads being bashed. You read it here first, folks. The unremarkable Rollies Coaster (#790) led into the remaining attraction, Sea Serpent (#791). It takes a true coaster counter to ride a second Boomerang in one day, especially after the first one was so uncomfortable. Surprisingly, however, this one proved to be for the most part smooth; perhaps we were just lucky, but it did seem that this model wasn't anything like as jarring as the one we'd ridden in the morning. 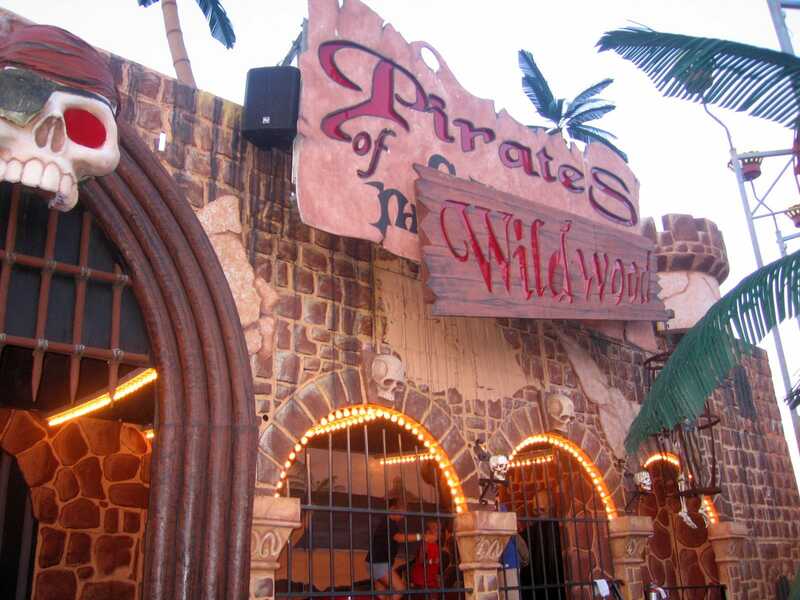 We finished up our time on the piers with a dark ride, Pirates of Wildwood. The ride apparently featured live actors, though the only ones we could see appeared to be eating their dinner half way through the circuit. Not that it made any difference, mind; the ride scenery was very colourful, and the special glasses made for a pseudo-3D effect that worked rather well. The two larger coasters at Playland's Castaway Cove were clones of those ridden earlier in the day; Python (#792) and Flitzer (#793). The kiddie coaster Sea Serpent (#794) was a new design for the day, having been previously seen in the Paramount parks under the guise of Taxi Jam. Much to our surprise, it featured some surprisingly good air time, almost unheard of for such a small ride; one has to wonder if this is a redesigned model, as it was certainly running better than the ones I had ridden before. When hitting minor parks one learns not to expect anything major from the roller coasters. Occasionally, however, one comes across a unexpected gem, and one such ride was Runaway Train (#795). This is a new production design from L&T systems, and it deserves to be a success in other parks too. George rated it nine out of ten, only the third coaster on this trip to gain that accolade. The other two coasters, Miner Mike (#796) and Wacky Worm (#797) were both obligatory stops but otherwise not worthy of note. We had enough tickets left after the coasters for one of us to ride the Ferris Wheel, and as my camera is utterly useless after dark it seemed like a good plan for George to use them. After a few minutes wandering I gravitated towards a DDR machine, where a teenager was making rather scornful remarks at two girls who were obviously playing for the first time. It seemed only right to take him down a peg, so I challenged him to a game on difficult. He accepted, and proceeded to be soundly beaten by me, first off on a song of my choice and then second on a song of his. Better yet, I hadn't played either before, which added a special pleasure to my victory! Steel Pier is located in Atlantic City, which is the east coast equivalent to Las Vegas. I'd actually seen this earlier in the week from the air, as my flight from New York to Raleigh had travelled down the coast line and the pilot had pointed out the bright lights of the area. It was already after eleven in the evening when we arrived, so rather than mess around we hit the kiddie coaster, Little Leaper (#798), following it in short order with a Crazy Mouse (#799). The latter was being operated in a rather mean spirited fashion, as the operator insisted on breaking up a group of four young girls into two and two, on a ride with four seater vehicles; there were two seats available in the first vehicle out. He wouldn't let all four get into the next one for some reason. Go figure. At any rate, it seems highly improbable that I will ever ride twenty one new coasters in a day again, and in some ways this is a relief; right now I'm so tired I can barely see the keyboard I'm typing on. This is, however, an entirely workable itinerary subject to the caveat above about Morey's Piers. 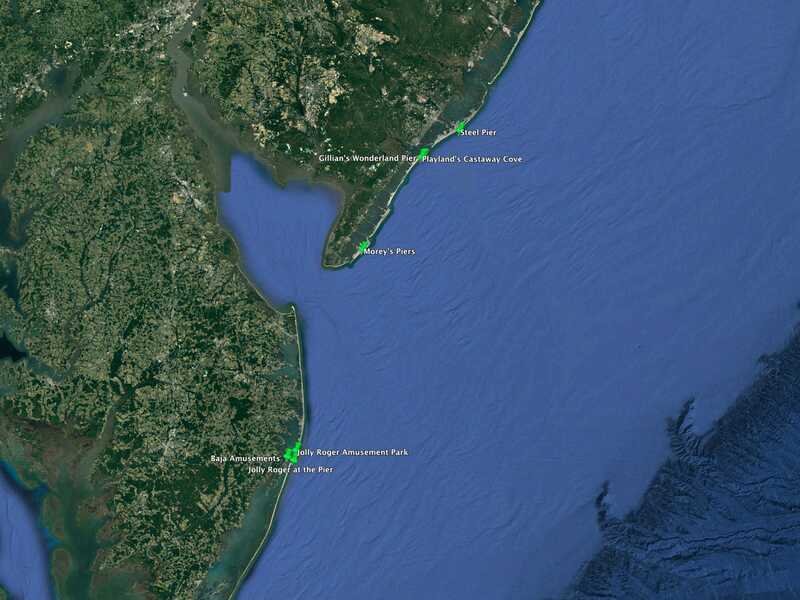 If I was planning this day again I would have finished there, combining the remaining parks with those from Seaside Heights, NJ on a second day. You live and learn.